The spirit of unity and respectful listening which characterised the first session of dialogue on the question of ordination of women was maintained as delegates continued their conversation on Friday morning. Lay delegates and pastor delegates, men and women, younger and older people joined together to explore the two key texts which divide opinion on this issue: 1 Corinthians 14:34,35 and 1 Timothy 2:11-14. Paragraph 11 of Article VI (The Ministry) of the Theses of Agreement enshrines the LCA’s current official teaching on the matter of the ordination of women. 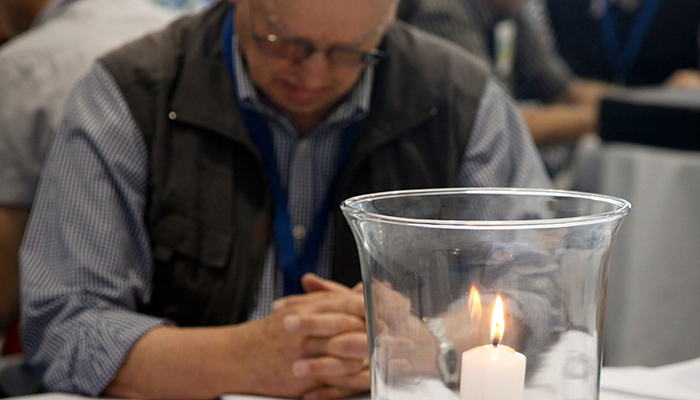 Co-chairs of the Ordination Dialogue Group, pastors Thomas Bohmert and James Haak, reminded delegates of the importance of listening again to Scriptures; to ask what the Spirit is saying to the churches in these passages and what the text is saying to them. They reminded delegates and table facilitators that it was vital that all around the table have a voice, and, as the buzz of conversation grew in the room it was evident that this was so. Once again the tone was respectful; perhaps a little more muted in some respects, but no less focused. My impression was that delegates were growing in confidence in the process, that they trusted their tablemates, regardless of whether or not they agreed with what they were saying. It wasn’t so obvious in their words—I do not eavesdrop—but in their body language. Again they leaned in, smiles abounded, and as they moved in to a time of table prayer, the spirit of love and concern for each other was strongly evident. The second dialogue session ended in the same way as the first: in prayers around each table. The Eighteenth General Convention of Synod continues. So neither the one who plants nor the one who waters is anything, but only God, who makes things grow. 1Corinthians 3:7 Makes me wonder why all the energy put into this issue when ultimately it is God who grows the church regardless of who planted or watered the seed – male or female! Fancy titles, vestments, traditions, orderly structures, gigantic candles and rituals are nothing if they do not plant or water the seed of God.